Fratelli Vineyards. Could be an Italian winery, right? Surprise surprise... it's an Indian vineyard at Akluj, Maharashtra that produces some really top class wines. At an elegant wine and dinner evening last month, Q Bar, The Hilton Chennai and Fratelli Vineyards presented The Art of the Table, where we tasted regionally sourced produce and Fratelli's single vineyard reserve wines as well as some from their international wine portfolio. It's only been 35 years since India started producing wines; it's only been a year since some of these top class wines have started being sold at Chennai. International wine consultant Craig Wedge who is also Brand Director of Fratelli wines commenced the evening telling us that India does produce some really good wines but sadly, many of these wines are not considered "worthy". 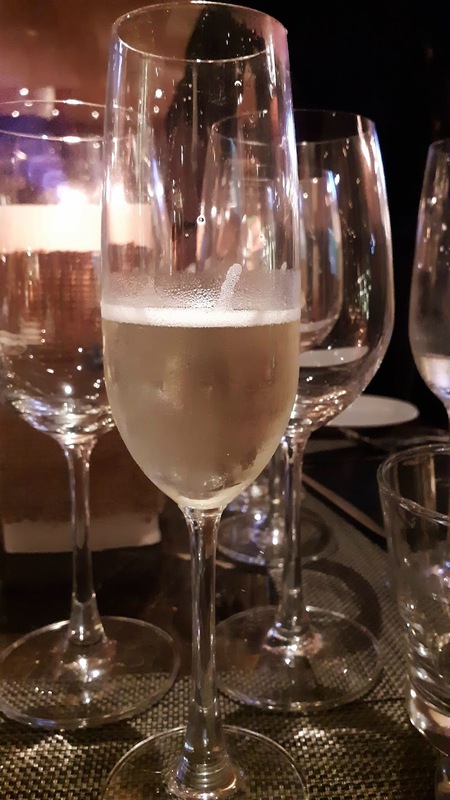 To prove his point, we tasted Fratelli's Grand Cuvée Brut Zero Dosage wine, a dry and crisp pale sparkling wine with a faint yeasty finish. Close your eyes, savour the wine. Yes, it has a 'made in India' label on it! Chef Manish Uniyal's culinary creativity was on show as the evening progressed, starting with the appetisers. 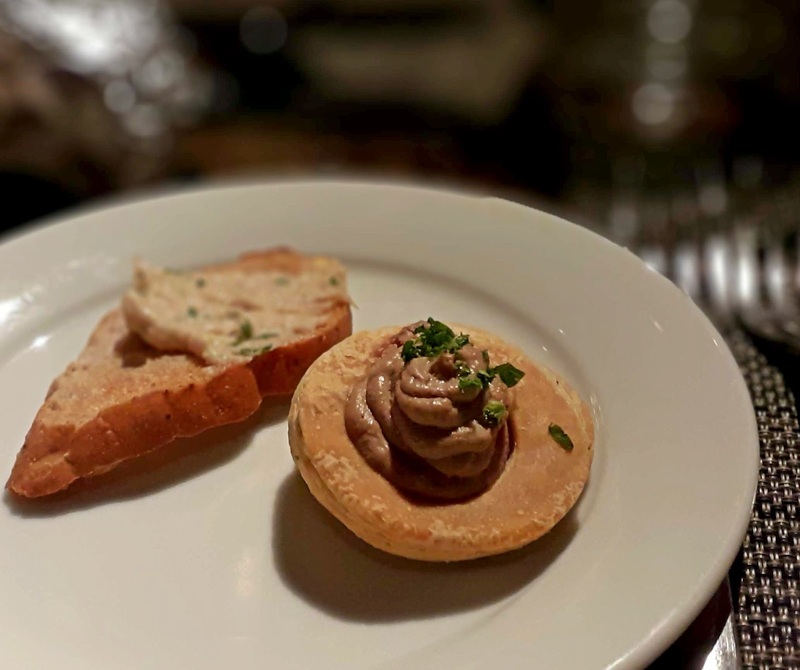 The selection of vegetarian and non-vegetarian offerings included apple and liver bouchée as well as pork rillettes on walnut bread, both of which were perfect with the wine. 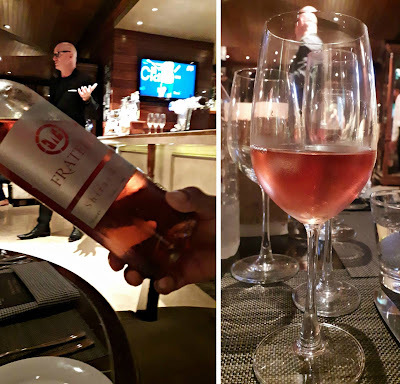 Fratelli's Shiraz Rosé makes for a lovely aperitif wine from Akluj. 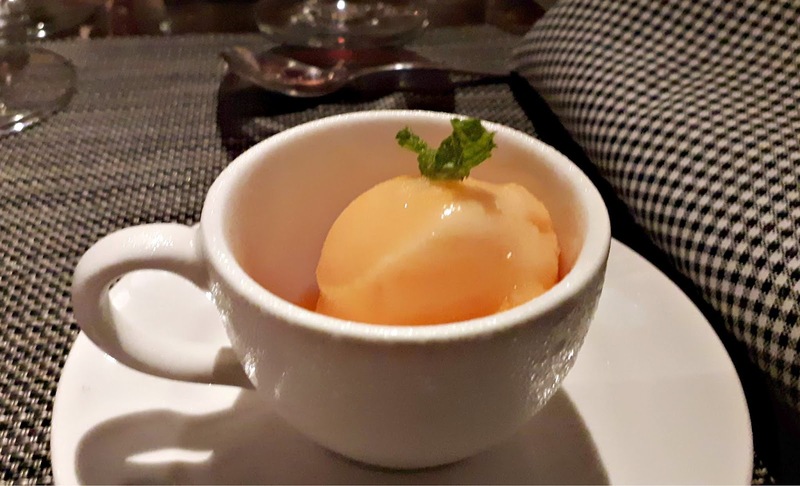 Pale pink and reminiscent of strawberries and red stone fruit in colour and taste, it was served with a green tea savarin. 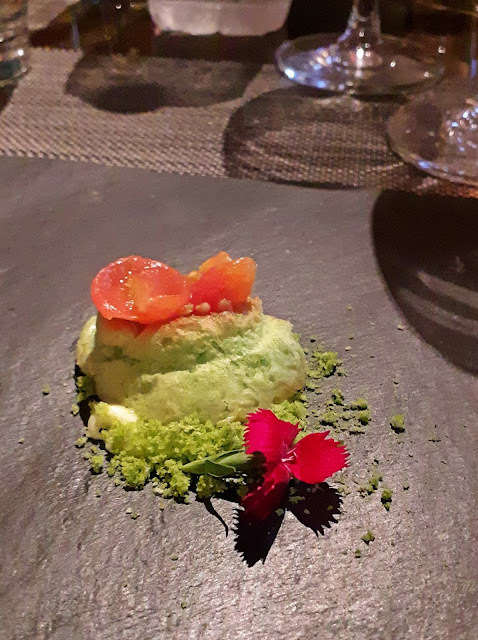 Not only were the colours striking but the cheesy aftertaste of the savarin was well-balanced by the acidity of the wine. We had Duck Three Ways with Moulin de Gassac Sauvignon. All three ways were delicious, the pairing wine a perfect match for the slight smokiness of the duck meat. The white asparagus truffle cream soup was silky smooth. Punctuating the silkiness were slices of white asparagus that added texture. It was delicately seasoned. 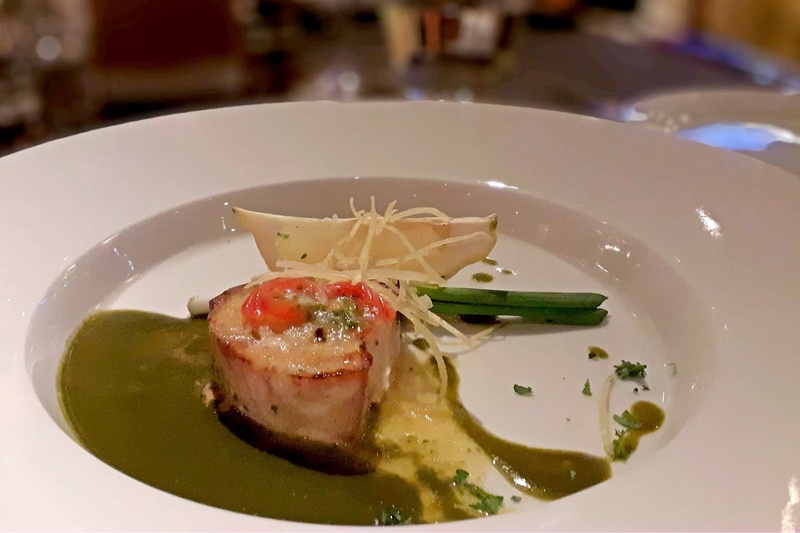 The first entrée was swordfish with green peppercorn butter. The flesh was firm and well-cooked though I thought the sauce could do with more acidity. Even the squeeze of lemon juice over did not really help. Of the two wines, Kloof Street Chenin Blanc from South Africa and Fratelli Sangiovese from Akluj, I preferred the Indian wine. 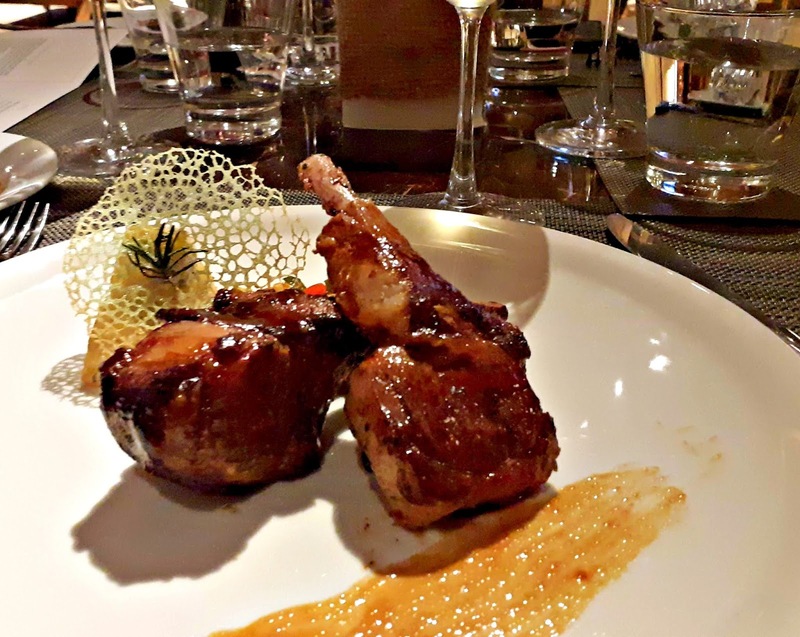 Balsamic glazed rack of lamb brought the spotlight back again on Chef Manish's culinary talents. Fork-tender lamb ribs finished with a balsamic glaze and a moreish Romano gnocchi to brush it up with. The delicate tuile had a faint herb flavour. Pretty as a picture too and perfect with the spicy notes of the Kloof Street Rouge from South Africa. A light end to the meal came in the form of a meringue. 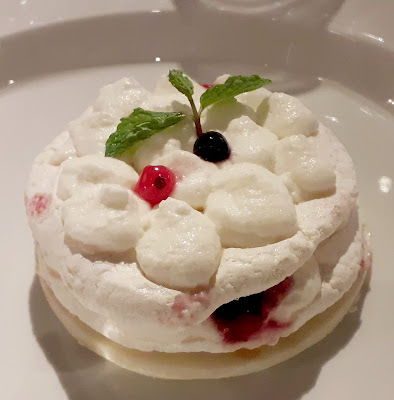 The tartness of the red berries cut through the sweetness of the pavlova, the soft-whipped Chantilly cream was almost cloud-like. The only jarring note in this creation was the too-thick disc of white chocolate. Perhaps, it was just that - not meant to be eaten. 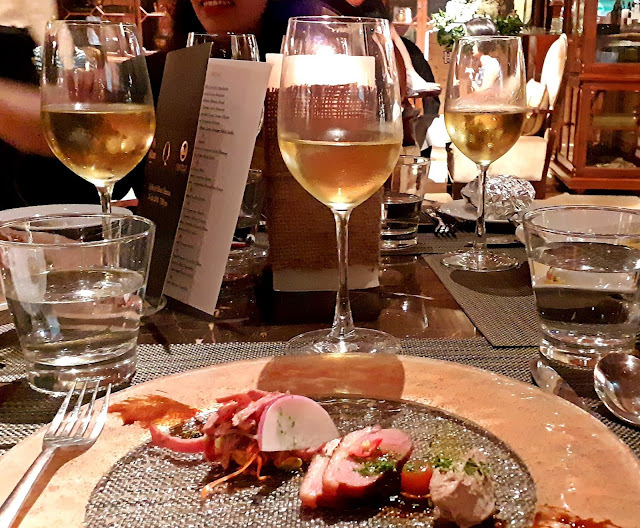 We talk of new world wines that are made in non-traditional wine growing countries but it was indeed an eye-opener to know that India also produces world class wines. 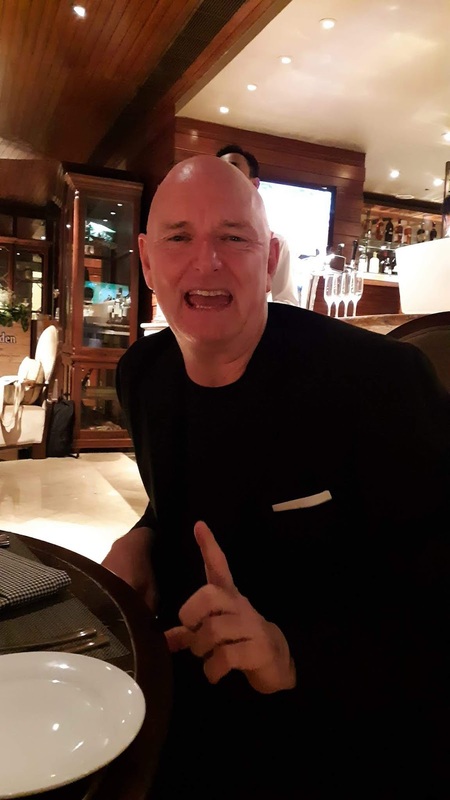 *This was an invited review.